We are proud to offer the WOLF HOUND 8.5 INCH fin. The second instalment in the wonderful collaboration between Neal Purchase Jr and the Salty Merchants. Neal is a renowned surfer, shaper and artist who has helped redefine surfing over the past decade with an anti-corporate approach to self expressive, stylish surfing and the associated culture. The WOLF HOUND 8.5 is a upscale single fin of its smaller 7.5 inch brother. Designed for all round surfing in boards ranging through 6-8 foot. It has been tried and tested by Neal in many boards over the past few years with many mid surf, sandpaper adjustments in the carpark; all narrowing down the best results and final outline we have today. All WOLFHOUNDS are machine cut and hand finished for the perfect result every time. Each fin also comes in a hand made corduroy case. A guide to positions and board types. 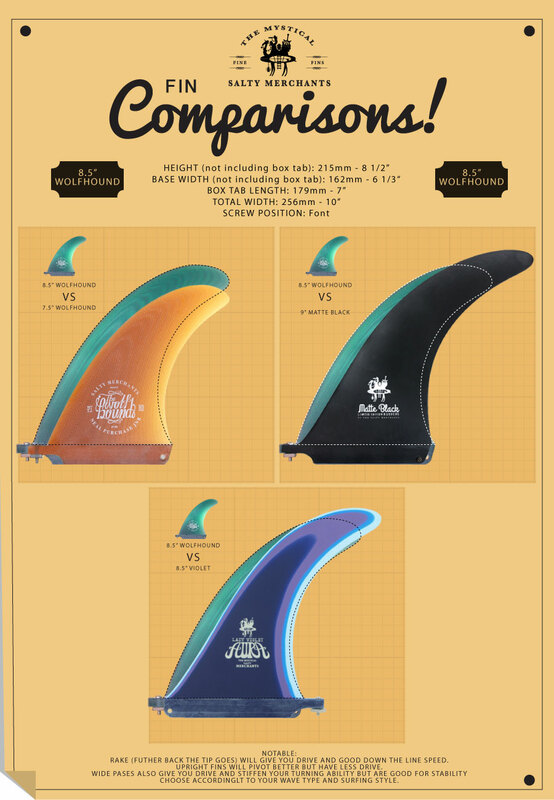 Compare the 8.5 Wolfhound to other small flex fins. A good alternative if you have a small board or tight tail. A good alternative if you have a larger board or wider tail.